The boom in the creation of seemingly endless outlets for viewers to be able to consume content has been pretty beneficial for all of us. The competition between these outlets has been a driving force for better, sustained content. Netflix is at the forefront of this revolution and I am really digging a lot of their original content with What Happened to Monday being no exception. The film tells the story of a dystopian future where overpopulation has caused the Earth to suffer from a lack of food and resources leading to a one-child per family rule, known as the Child Allocation Act, pioneered by Nicolette Cayman (Glenn Close). Any family that has multiple children must surrender the extra siblings to be put to cryo-sleep, a type of hibernation that allows the children to wake once the world is in a better place. Terrence Settman’s (Willem Dafoe) daughter gives birth to identical septuplets in an underground clinic to avoid having to put them to cryo-sleep, but unfortunately she dies during the procedure. Terrence raises the children, all named after a day of the week. 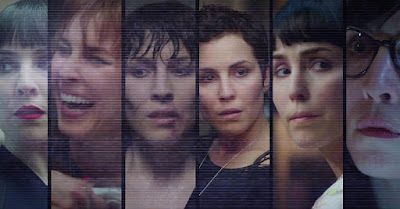 Inside their apartment they are allowed to be themselves and act and dress how they wish, but when they go outside the apartment on the day that corresponds to their name, they all must take on the identity of Karen Settman (Noomi Rapace). At the end of each day, the sisters all debrief and the one who was outside that day fills the rest in on what took place to ensure a seamless transition from day to day. The plan works for decades, until one night… Monday doesn’t come home. What Happened to Monday really took me by surprise. Throughout the film there were numerous small futuristic tweaks that were not excessive and seemed totally plausible. From small projectors that display information on characters palms to futuristic mirrors that reveal exactly where and what makeup all the siblings should apply to make sure they look identical upon leaving the house, these advances serve to enhance the story and the future world that is being portrayed throughout. Director Tommy Wirkola successfully builds this world and keeps things in perspective without the need to have crazy futuristic cars or gadgets ala IRobot. It is an interesting take that helps keep the audience engaged and not checked out from total disbelief. I cannot emphasize how fantastic of a performance Noomi Rapace put forth in this film. Rapace plays all seven sisters perfectly, each having unique characteristics to set them apart. I was impressed at how seamlessly all the characters interact with each other, including fight scenes throughout the flick. The fighting has a brutal realism to it. It has elements that may have tread right near over-the-top territory, but it all works in the context of the film. Parts of the movie do feature gruesome and gritty violence, but it fits within Wirkola’s vision. There are times Joe (Christian Rubeck), a ruthless agent of the Child Allocation Bureau, relentlessly tries to capture or kill all seven sisters, reminiscent of Agent Smith chasing Neo throughout The Matrix. Joe acts like a robot with only one objective, to hunt down these sisters although the reason why seems a little shaky and underdeveloped. The questionable motives aside, these fight and chase scenes are done incredibly well and provide a consistent pacing for the film. If you are looking for the next Citizen Kane or Casablanca, What Happened to Monday is not for you. There are times when the plot gets convoluted and outlandish. Please do not forget that you are watching a movie about Septuplets going against an authoritative government, so outlandish should be expected. However if you are in search of an entertaining and enjoyable sci-fi action flick, then you came to the right place and What Happened to Monday delivers. It will be available on Netflix August 18th.